Double Drip Lemon Sherbet Nic Salt E-Liquid | Electronic Cigarette Co. 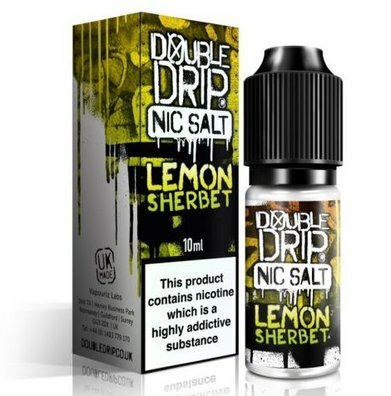 Lemon Sherbet salt nicotine e-liquid from Double Drip features a pleasantly bitter lemon flavour with sparkling rainbow sherbet. All-in-all a refreshing fizzy citrus flavour. This is a 50% VG Salt Nic e-liquid blend which is different from traditional eliquid. Salt nic juices deliver a much smoother nicotine hit, however, the nicotine level can still be high and will provide a strong dose of nicotine. Best used with cigarette-like devices, vape pens and all-in-ones. Please read our nic salt article for lots more information.